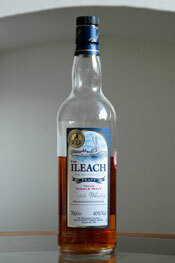 I have become a fan of peated whiskies over the last few years but I can’t quite settle with The Ileach Peaty. It’s not that it is distasteful, it just that it feels, well fake. It doesn’t feel like a peaty whisky, more a whisky with peat flavourings added. Now it is a no-age statement whisky so I am not expecting a top class dram, but there doesn’t appear to be anything more than medium strength, slightly artificial peaty note to the nose and on the palate, it would be nice to have something else there, something genuine that you can sink you teeth into. I found the finish a little surprising as well because the palate is smooth but the finish is a little too bitter. It may just be the lack of age that lets it down, but I would personally spend the extra on something like a Laphroig if you want a peat monster or save a few quid and go for a Ledaig if you want a more subtly peated whisky. Sorry Ileach.